When Cillian Jackson needed a power wheelchair, the members of the Farmington High School Robotics team got to work. 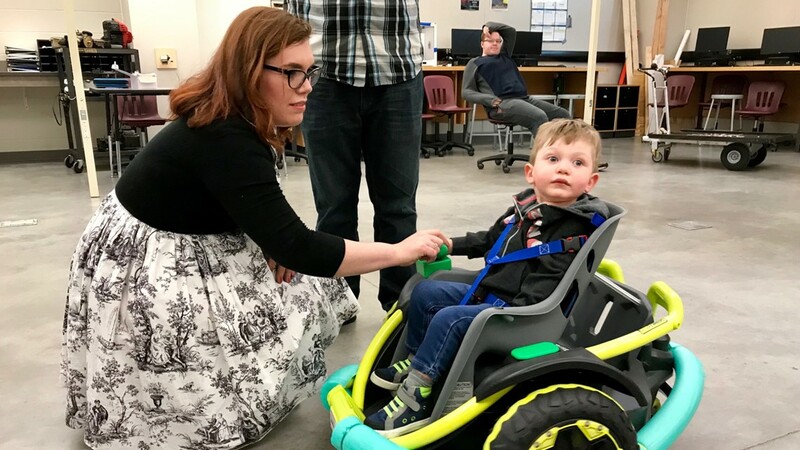 Two-year-old Cillian Jackson zooms around on the wheelchair built for him by the Farmington High School robotics team. 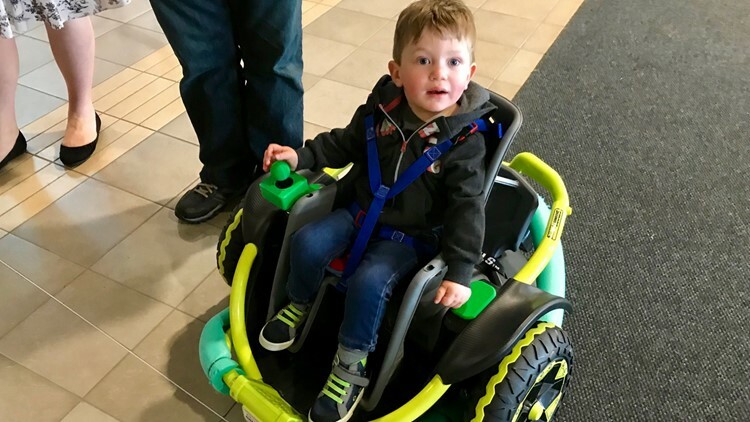 FARMINGTON, Minn — In need of a costly power wheelchair for their son, the parents of 2-year-old Cillian Jackson turned to an unlikely source. Teenagers. Cillian was born with a genetic condition that makes mobility difficult. “He has an especially hard time controlling his body. He has a lot of symptoms you’d see in someone who has cerebral palsy,” said Tyler Jackson, Cillian’s father. 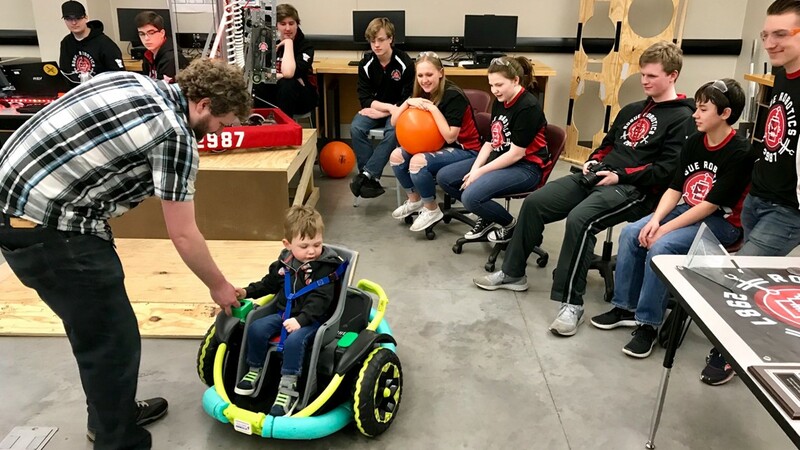 Tyler Jackson assists his son Cillian as Farmington High School Robotics Team members look on. 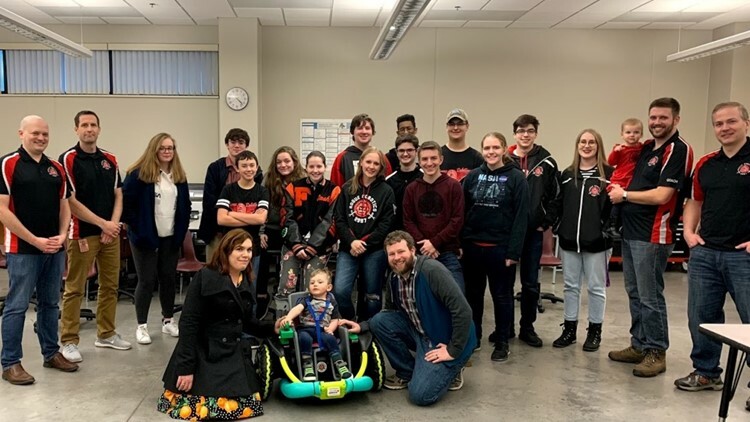 Tyler Jackson reached out to the robotics team at his former high school after he realized an actual power wheelchair would be cost prohibitive for his family and unlikely to be covered by insurance due to Cillian’s young age. Farmington robotics coach Spencer Elvebak says there was no hesitation by his students. “I brought it up to the kids at a meeting, ‘Is this something we want to step up and do?’” Elvebak recalled. The sentiment was unanimous. Yes! 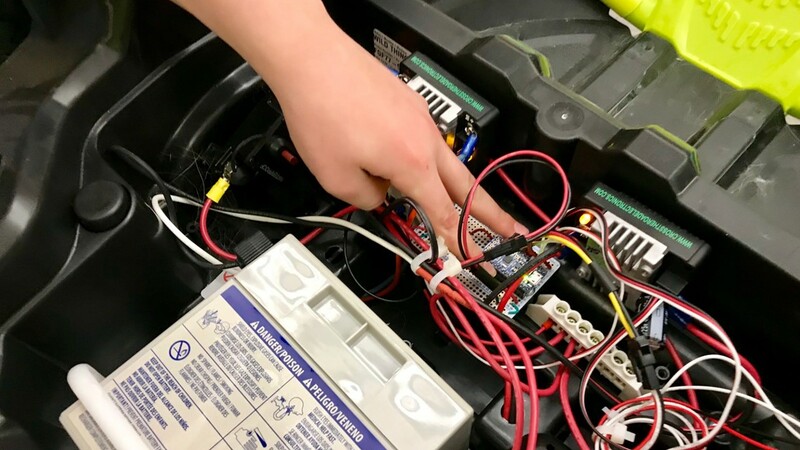 Farmington High School Robotics Team member Alex Treakle points out the electrical components he replaced in a Power Wheels toy. “That’s the great part of my job, to work with these kind of kids,” Elvebak said. The members of the robotics team replaced nearly every electrical component in the Power Wheels toy, mounted a seat from a bicycle carrier and designed a joystick to fit Cillian’s needs the students fabricated on a 3D printer. 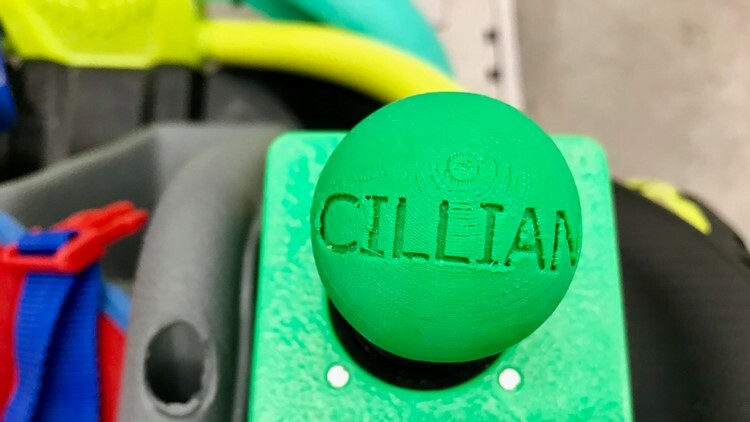 Custom joystick designed for Cillian Jackson by the Farmington High School Robotics Team and produced on a 3D printer. 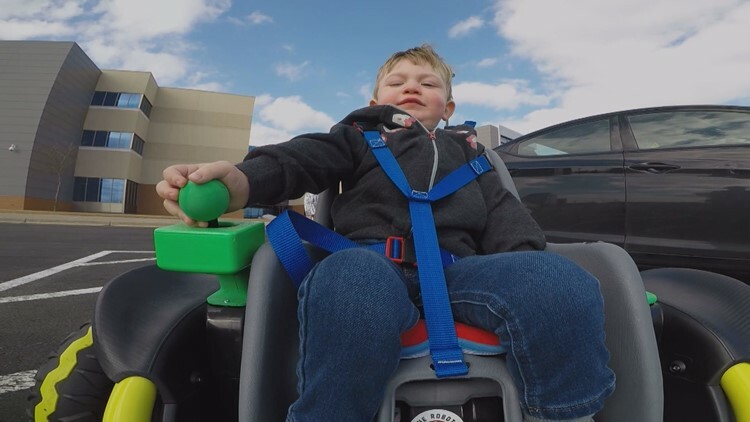 Along the way, they sought technical assistance from “GOBABYGO!” - a program at the University of Delaware that helps give mobility to children with disabilities. But mostly the Farmington students relied on skills they learned building their competition robots. “Instead of completing a task, we’re helping change someone’s life,” team member Drew Eisenzimmer said. Cillian took to his ride immediately. Last week, four months after receiving his wheelchair, Cillian returned with his family to the school and was reunited with the teens responsible for his gift. They watched, smiled and waved as Cillian traversed the classroom. Cillian Jackson in his retrofitted power wheelchair. “This really helps him explore like he’s never been able to do before,” Cillan’s mom said. Actual power wheelchairs can cost more than $20,000. Cillians' father said insurance reimbursement isn't an option at this time. "Cillian still lacks some of the maturity and focus to drive an electric wheelchair in a public setting, which is the primary reason why he hasn't been approved for one. Frankly, we haven't even tried yet because we know he would be denied based on the proficiency requirement," Tyler Jackson said. In the meantime, Jackson said, his son "has the ability to keep working on that proficiency while simultaneously being able to explore on his own to help with his cognitive development." 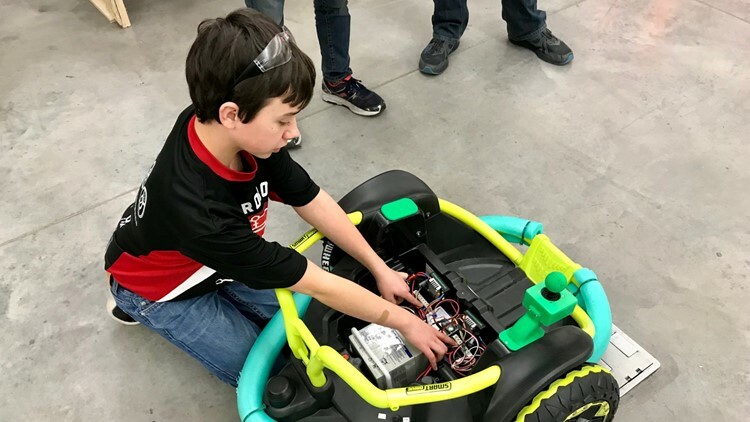 The Farmington High School Robotics Team has earned more than its share of trophies over the years, but this is different. Some of the electrical components replaced in the Power Wheels toy that became Cillian Jackson's wheelchair.